Amid a Flood of Plastic, Big Companies See Opportunity - Integration Through Media ....! (VOA): Once a month, accountant Michael Byrne pulls on his rubber boots and makes his way to a spot on the banks of the River Thames. He carefully marks out a one-square meter (11-square foot) patch and, with gloved hands, catalogues each bit of plastic he finds, meticulously reporting the data to the environmental group Thames21. On Aug. 20, for example, he and other volunteers found an average of 31 food wrappers, the sticks from 29 cotton swabs, 12 bottle tops and about 100 pieces of small chewed up plastic in each patch. Public awareness of the problem of plastic waste is swelling after alarming forecasts that there could be more plastic than fish in the oceans by 2050. Plus the shocking images are rolling in: Britain's Sky News' campaign against ocean plastic featuring whales bloated by plastic bags; National Geographic's chilling picture of a seahorse curled around a pink cotton swab, and filmmaker David Attenborough's documentary “Blue Planet II” footage of sea turtles shrouded in plastic. And where consumers' attention goes, so does that of companies. In the last few months, Amcor, Ecover, Evian, L'Oréal, Mars, M&S, PepsiCo, Coca-Cola, Unilever, Walmart and Werner & Mertz – which together use more than 6 million metric tons of plastic packaging per year – have committed to using only reusable, recyclable or compostable packaging by 2025, according to the Ellen MacArthur Foundation, an innovation think-tank. Adidas, meanwhile, is making a line of clothing from recycled plastic bottles and promoting the products with an online video underscoring the health threat to humans of ingesting plastic particles found in fish. Negozio Leggero, a high-end food store in Italy and Switzerland, features 1,500 package-free products. British supermarket chain Iceland is planning to remove all plastic packaging from its own-brand products by 2023. These are the companies, after all, that have profited from a business model that wraps everything from spring water to cleaning products in plastic packaging that is used once and thrown away. Global plastic production increased to 380 million metric tons (418 million tons) in 2015 from 2 million metric tons in 1950, according to research by Roland Geyer, a professor of industrial ecology at the University of California, Santa Barbara. About 60 percent of the 8.3 billion metric tons of plastic produced throughout history has ended up as waste, with more than three-fourths of that going into landfills or the natural environment, Geyer estimates. In 2010 alone, between 4 million and 12 million metric tons of plastic entered the marine environment. The material kills and maims wildlife and makes its way into the food chain. 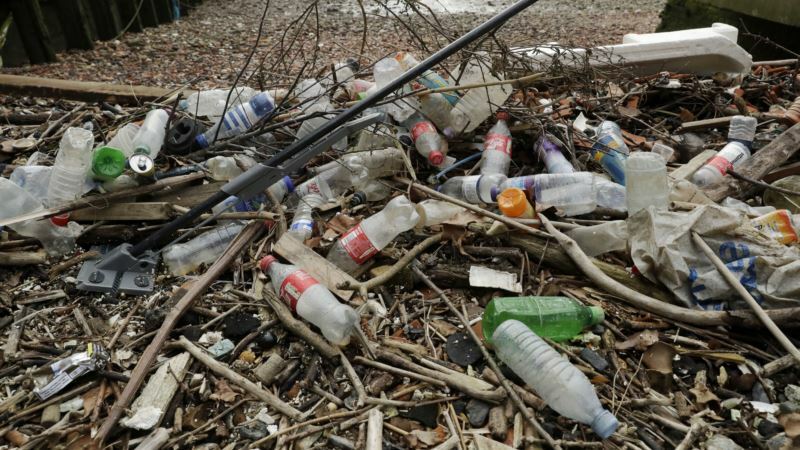 The Ellen MacArthur Foundation highlighted the issue last year in a report that said the weight of plastic in the oceans would equal that of fish by 2050 if current trends continue. Only 14 percent of plastic packaging is currently collected for recycling, according to the foundation, which works with companies like Google, Nike and Danone. Action is needed on multiple fronts, it says. Market research group Mintel says we may eventually see “social stigmatization” of plastic cups and cling film, with firms developing soluble packaging and more retailers shunning products encased in plastic. Governments and other institutions have also begun to focus on the issue. The EU has set a target to recycle 65 percent of urban waste by 2035. Britain last year outlawed the use of plastic microbeads, and the government says it will consider taxes on single-use plastic as part of an effort to eliminate all “avoidable plastic waste” within 25 years. The Church of England suggested its members reduce their plastic use for Lent. Geyer says initiatives are nice, but recycling and reuse campaigns have done little to stem the tide of plastic pollution over the past 30 years. He believes society needs to contain its rising demand for plastic as companies and governments pursue ever-increasing growth. Oceans are simply “collateral damage” in the consumer economy, he said. That's not stopping people like Byrne from trying to spread the word. The accountant has 60 sets of rubber boots to loan to anyone who joins him on the banks of the Thames. He gives everyone a safety briefing, and there's a promise of an afternoon at the pub after the cold and often grueling work of trash counting and pickup. “We have a problem with plastic,” he said. “Everyone knows that, but let me say it again – we have a problem with plastic. We have to do something.